We specialize in the facilitation of the ROC 5 Phase Application Process as well as the development of the ROC Operations Manual (ROM) – and will be with you every step of the way. 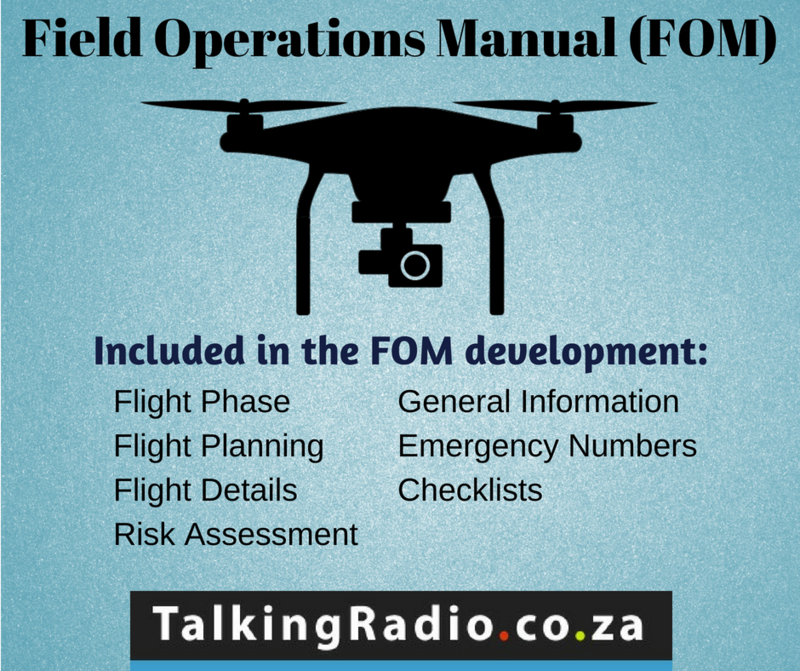 Talking Radio’s current RPAS Clients include operators in the multi-rotor and fixed wing category ranging from less than 2 kilograms up to 80 kilograms and we look forward to facilitating the development of your ROC operation next! a) Development of ROC Operations, Safety Management, Quality Management System and Security Manual/s. b) Development of a Template for the ROC Operations Manual in accordance with the SACAA CATS and CARS (Part 101). c) Online Research and liaison with SACAA RPAS Inspectors. d) Assisting the Client with the completion of all required documentation and liaison with the CAA in accordance with the Regulatory 5 phase process. e) Review of the Clients RPAS user Manual as guidance to work from prior to populating the ROC draft Operations manual with the relevant content. f) Populating the Operations Manual with content specific to the company. g) Development of a draft ROC Quality Management System (QMS) as part of the draft ROC Manual. h) Development of a draft ROC Safety Management System (SMS) as part of the draft ROC Manual. i) Development of associated Appendices which compliment specific information in the draft ROC Manual. j) Proofreading and Editing which forms part of our Quality Control services. k) Handover of the Draft ROC Operations Manual, QMS, SMS and Security Manuals to the client for submission to the SACAA for review as part of the accreditation process. l) Amendment to the Operations Manual (including the SMS and QMS) following the SACAA initial review of the draft Operations Manuals. This includes any required amendments to the associated SMS, QMS and Security documentation. Please note that although Talking Radio will be able to communicate with the SACAA on the client’s behalf for guidance and/or clarification it is their responsibility to communicate directly with the SACAA regarding the actual ROC application. Please contact Cornell Morton for more information.